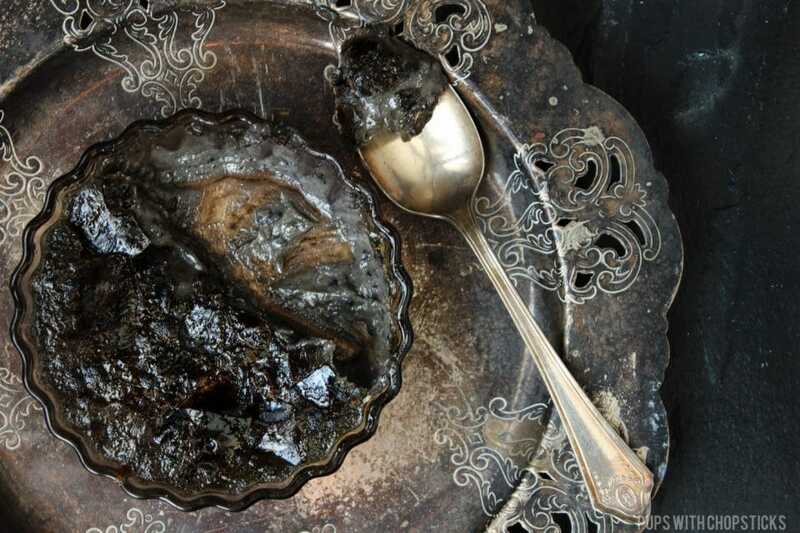 Before we start, I must warn you now – This is a very decadent and rich dessert. This is definitely not something I would normally make for myself because I would probably eat all of it on my own and regret it within the hour. Speaking of black bits on teeth, this would definitely be a very thematic treat for Halloween parties because of the added affect on your teeth! haha Just a thought! 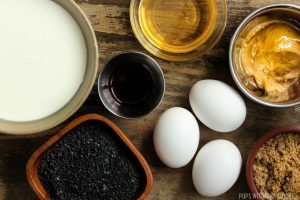 All ingredients should be available at your local grocery store, with the exception of black sesame seeds which might be a bit more trickier to find. I usually find these at an Asian grocery store. I used the raw unsweetened peanut butter for this (the kind where the oil separates from the nutty stuff) If you prefer to use normal peanut butter, I don’t see how that would be a bad thing – just make sure it is unsweetened so you don’t over do it with the sugar. Neat tidbit about the natural raw peanut butters I like to do to prevent it from separating: Stir it up real good when it is in room temperature so it is fully mixed, then put it in the fridge upside down for a day. After a day you can put your peanut butter right side up again and it will stay mixed up as long as you keep it in the fridge! 🙂 No more separation! I used a kitchen torch to make the sugar coating on top of the creme brulee because I did not have any oven safe containers to make these in. 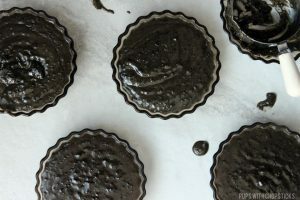 However, if you have oven safe ramekins the easier route might be to stick them in your oven, with the rack set high near the broiler and broil the sugar topping for 2-5 minutes. Watch it like a hawk because brown sugar loves to burn. Eggy Flavoured Creme Brulee? No Thanks. There have been many many times in the past where I have created eggy flavoured creme brulee and as much as I love eggy flavoured things, creme brulee is not one of them. You can use a double broiler method to cook the custard as well but I’m not a fan of creating extra dishes unless it is absolutely necessary. 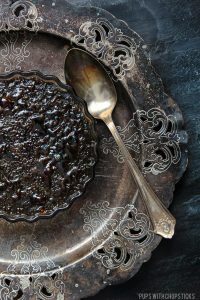 For this recipe I used both white sugar and brown sugar to create the hard candy topping. 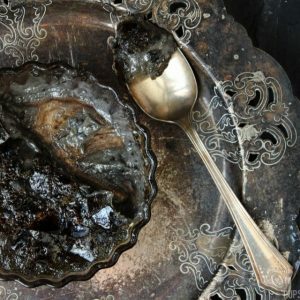 I found that when I used just white sugar, it wasn’t giving me enough flavour – besides sweet and when I used just brown sugar it didn’t give me that nice hard candy topping but it gave me flavour so I combined it! I added a few teaspoons of white sugar into the dish and swirled it around to lightly coat the tops of the custard with sugar. Any excess white sugar I would pour into the next dish and repeat the step. Then I would lightly sprinkle some brown sugar on top of that and then torched it! 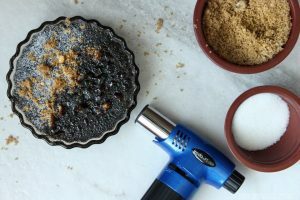 This black sesame creme brulee is a deliciously decadent, creamy and rich dessert with a wonderful nutty flavour with a caramelized hard candied top! In a small pot, heat up the cream on medium low heat until it is hot. Watch this carefully and keep stirring the cream so it doesn’t burn on the bottom of the pot. 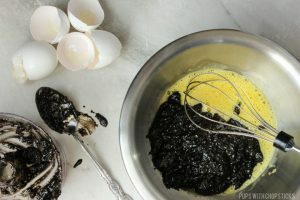 Once the cream is hot, slowly add it into the black sesame egg mixture (approximately 1/2 – 1 cup at a time) Keep stirring the egg mixture while you are doing this to prevent the eggs from cooking. Once all the cream has been well mixed into the sesame egg mixture, add it all back into the pot and cook it over the stove on low heat. At this point, it is very important to keep stirring it. We don’t want to make scrambled eggs, so keep the custard mix moving and off the bottom of the pot. Once it is at the right consistency, turn off the heat and remove it from stove immediately. Over cooking the mixture will cause an eggy flavoured creme brulee. Pour the mixture into little dessert bowls (preferably oven safe ones) and refrigerate it for a minimum of 1 hour. 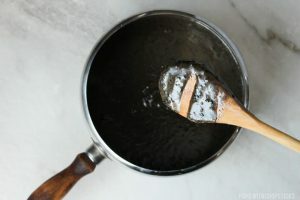 When you are ready to serve it, add 1-2 teaspoon of white sugar to the top of the of the creamy mixture and swirl it around to give it a light coating of sugar, pour any excess sugar to the next bowl and repeat. 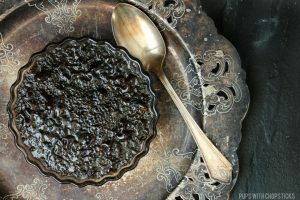 An alternative option to cooking the black sesame custard directly over the stove, is to use a double broiler to cook it over a gentler heat. It’s not necessary but a more fool proof method to not overcook the custard. Neat tidbit about the natural raw peanut butters I like to do. Stir it up real good when it is in room temperature so it is fully mixed, then put it in the fridge upside down for a day. After a day you can put your peanut butter right side up again and it will stay mixed up as long as you keep it in the fridge! 🙂 No more separation! ahhh this sounds awesome!! 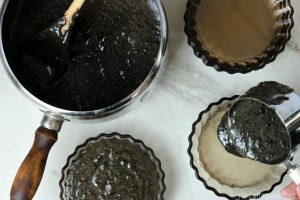 i love creme brulee, i love black sesame, so i’m sure i’d love this too (: the pb is unexpected but also makes total sense (if that makes any sense at all). It’s already nutty, why not go full hog crazy nutty right? (and no, no sense at all 😉 ) hee! Wow! This looks insanely good. Must save for later. Creme brulee is my all time favourite dessert. I always order it in a restaurant. I’ve never tried one as exciting as this before. This is definitely the most unique creme brulee recipe I ever seen. I’m so intrigued, and I love sesame. I must try ti! I love creme brulee but have never tried black sesame seeds. How intriguing! And the peanut butter must add an extra depth of flavor. Now that is all kinds of fun. Now Creme Brulee has a whole new audience. Love it! Yay for FUN! 😀 haha! I’m a big fan of creme brulee and this is such a fun approach for Halloween! I’m all over this! I know right? 😀 I swear I’m going to use the black speckles on my teeth as part of my costume haha! You literally have my mouth waters ! I would be willing to take your regret feeling away! Just send some this way 😉 My favorite part of eating creme brulee is cracking that sugar ! LOL! Haha that is definitely my favourite part! Cracking the sugar! !